What is an Eternal Tribute Website? An Eternal Tribute Website is a reasonably priced alternative for the high cost of placing an obituary in your local newspaper. If you’re not careful to limit the information you want to share in the obituary, your cost could easily run over a thousand dollars! An Eternal Tribute Website is just that… it’s eternal… it never expires! For a reasonable fee, we will place your loved one’s photo, the Obituary, Eulogy, and slide show on your loved one’s Eternal Tribute Website. Plus you can upload photos into an album. Family members and friends can sign the guestbook. You can also add stories and precious memories. An Eternal Tribute Website often become the gathering place for heirloom family photos and family history. 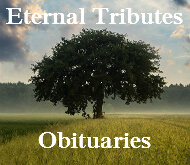 Our suggestion is to post a short obituary in your local newspaper with information about the time and location of services, and then refer your readers to the Eternal Tribute Website. When reading the newspaper obituary posted online, a link will take them to your loved one’s special page.